Long ago in Ireland, Celtic storytellers were very important people in the community; they had the task of preserving history in their stories. Like the Native Americans, the Celts had an oral culture and an elaborate mythology. Storytellers trained for years to become masters of their craft and they committed their knowledge and skill to memory. These stories were recited aloud and provided great entertainment for the people. Bairbre McCarthy continues the oral tradition of the Celts. Featuring stories of ancient kings, fairy folk and historical heroes, the mythological legends she tells blend with the early history of Ireland. She teaches and performs for audiences of all ages. Bairbre works closely with librarians and teachers to design programs that fit their curriculum. Her residencies culminate in a storytelling performance with students. 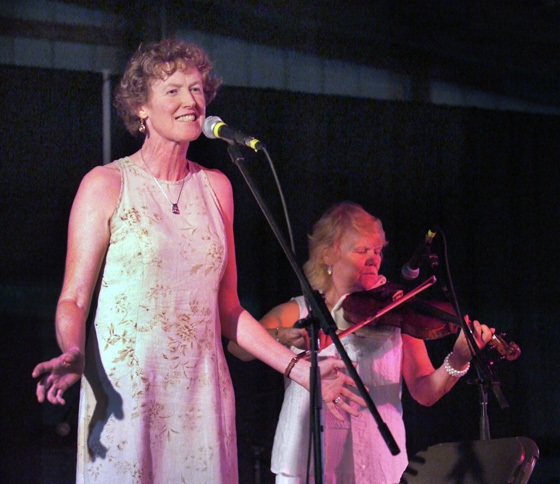 For concerts, Bairbre enjoys collaborating with musicians in "A Musical Journey through the Stories of Ireland," a family program that includes audience participation in song and story. Bairbre has the experience to help collect and share local stories that connect the past, present, and future of a community. She encouragers story-sharing in her workshop “Good Memories make Great Stories.” This workshop usually culminates in a storytelling performance with Bairbre and frequently creates an interest in community story archiving. Many of Bairbre’s programs have received funding through grants. She is an experienced grant writer and is happy to assist in writing grant proposals. Choreographer Ellen Sinopoli, storyteller Bairbre McCarthy and ESDC dancers take families on a fantastical journey as they weave stories, song and dance to follow the footprints of the Celts from Central Europe to Scotland, Wales & Ireland and then across the Atlantic to Appalachia. See and hear the myth of the Seal People, the Legend of the Swans, the Adventures of Jack(beyond the beanstalk), the Tale of Norouas, the Northwest Wind, the fable of Dagda’s Magical Harpand the hilarious yarn of how Marika Got Her Story . These are stories of a very special people that bring laughter, thrills, sadness and silliness to touch your hearts.